What is not to like about riding along the bay? As the weather changes so too does the beauty of the sea, from calm and still in bright sunshine or in mist, to rough and choppy. This ride is always a delight. The ride commences near Southern Cross Station at Clarendon Street/South Wharf outside the Melbourne Exhibition Centre (aka Jeff’s Shed). It follows the bike path alongside the light rail trail to Port Melbourne and then heads east and south along the Bay trail. 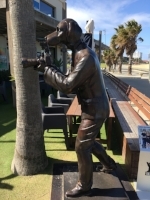 As you ride south from the city to Elwood look out for a range of public sculptures, including the sun and planets (scale models spread out over a few kilometres), the Tommy’s Story sculpture (a bronze sculpture of a pair of trousers and shoes on the sea wall, and Angelina Rabbitgirl and Dogman. Just after you cross over Elwood Canal, there is a wooden beacon on a hill on your left. Ride across the grass and up the path to the top to enjoy some great views of Melbourne. In Brighton look for the bathing boxes and take in the views across the bay to the You Yangs. There are cafes and toilets at frequent intervals on this route. Favourite cafes include North Point (at the end of North Road behind the Foreshore Playground about 1km after Elwood Beach) and Sandbar (on Middle Park Beach). The ride is along bike paths and is mainly flat. This ride is more challenging when there is a strong southerly wind. In this case you may prefer to start at Brighton Beach. Start at Southern Cross Station in Spencer Street. Walk your bike south across the river to reach Clarendon Street/South Wharf outside the Melbourne Exhibition Centre (Jeff’s shed). Cross Waterfront Place at the pedestrian crossing. Turn left onto the Bay Trail. At St Kilda Pier pass through the bollards back onto the off road path. 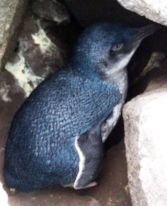 Little (Fairy) Penguin at St Kilda. 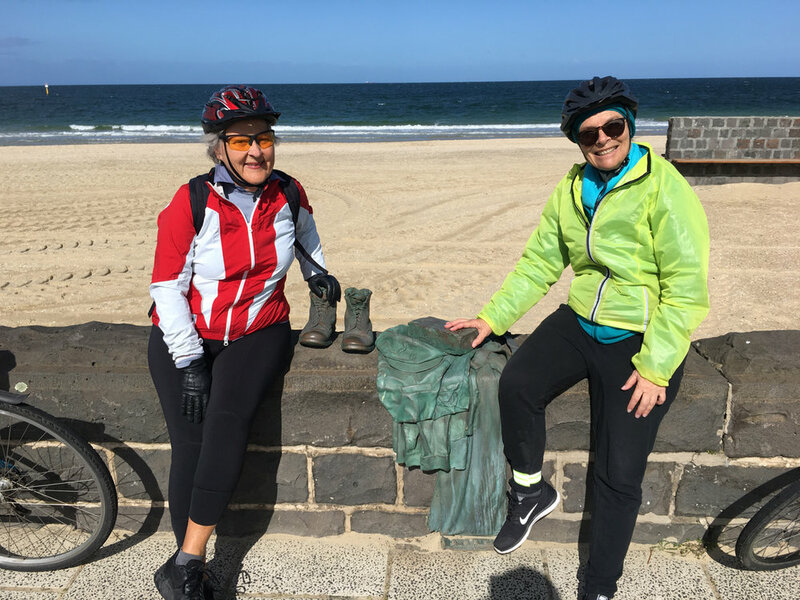 Ride down St Kilda Pier to and around the back of the kiosk to look for Little Penguins (known locally as Fairy Penguins because of their small size) in the rocks of the breakwater. following the route in Westgate Park. Just continue straight ahead at Station Pier. starting at Flinders Street and going past Albert Park Lake as in City to St Kilda Circuit. When you reach the beach, turn left instead of right. adding all or part of Beaches and Cliffs. Google: The map starts just south of the Yarra River. Note that it is incorrect at the purple circle. Here do not turn left onto Beach St. Instead continue straight ahead past the tram stop to cross Waterfront Pl at the pedestrian crossing before turning left.